The many fires that have broken out are going to be short lived. We are at the very beginning of 4 days of stormy, cool and humid weather. Although the local weather outlets are saying "up to 2 inches of rain for the Sierra", they are completely off base. It seems to me that everybody was so afraid of the winds, that they never considered the precip. The Western shore of Lake Tahoe will pick up between 5-10 inches of rain and quite a bit of that will be very wet snow.That will douse any fires that still remain. The leeward side of the Carson Range (Reno Foothills, Washoe Valley, Carson Valley) will pick up between 2-5 inches of rain, again enough to douse any fires that still remain. 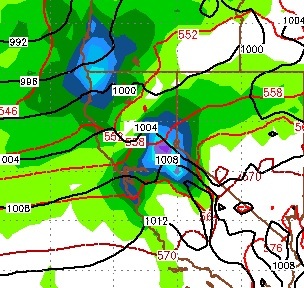 In fact, the valley floors will pick up 2+ inches of rain, not the Sierra. The sensationalism of our local journalists, is bordering on irresponsible. 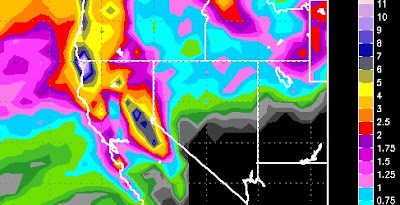 As you can see the Sierra, west of Lake Tahoe is in line for 5-10 inches, at least. The Carson Range, east of Tahoe is in the 4-6 inch range. Folks, this is liquid precipitation, Any snow that falls, and right now we are looking at about 9,000 foot elevations, are going to further douse and deter the fire. We will get a break from the precip very early Saturday morning, but by Saturday evening we are in for about 36 hours of heavy Sierra rain and Snowfall. Here is a look at the forecast for Sunday afternoon. What remains of any fires will be over by the end of Sunday. Also notice that the rain is forecast to spill over the Carson Range into the valleys. Winds will pick up again between precip events, so we are not out of the woods yet. However, right now the Sierra and Carson Range are getting very heavy rain. I expect that to continue for another 4-5 hours. Speaking of fires, with wind gusts nearing 100mph, what an amazing job our Fire Fighters have done and continue to do! Have you hugged your Fire Fighter today?